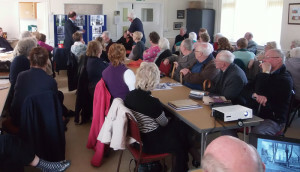 Our Speakers at the coffee morning were Gerry Hindley, Mike Hewitt and Pam Clarke, who gave an interesting talk on the history of the water conduit in Cannock. 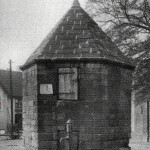 The Conduit Trust was formed in 1735 to bring fresh water to Cannock. The trust is still active today, they have restored two of the original pumps, and placed plaques as near to the original sites of the pumps as possible. Pam told us how the plaque commemorating the generosity of Dr. Byrch came to be in a wall in Appledore Close. The Senior Citizens centre is open on the FOURTH WEDNESDAY of every month, for members to view our archives, photographs and other ephemera. Why not pop in for a cuppa and a chat, we are open from 10:30am until 1:30pm, it is very informal, just come for an hour, if your time is limited. 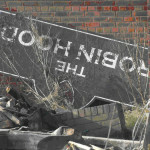 We were sorry to see the demise of the Robin Hood. 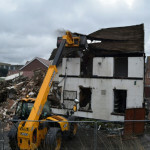 It has been a landmark at Churchbridge for nearly 200 years. 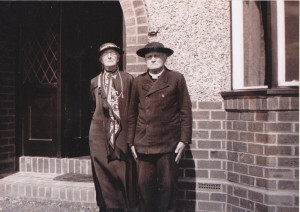 Does anyone know who this jolly looking couple are? Melanie Williamson, from the Museum at Shugborough, gave a very enlightening talk on the history of shoes. She also talked about the history of the Lotus Factory, and brought with her a display of the equipment and tools used in shoe making. From this month the Senior Citizens centre is open on the third WEDNESDAY of every month, for members to view our archives, photographs and other ephemera. Last month 14 people attended, some helped archiving some documents, others did their own research. We are open from 10.30 until 1.30, it is very informal, and you can just come for an hour if your time is limited. The coach trip to Tutbury is now full. We have started a ‘reserve list.’ It was decided that we would ask Lesley to perform as Mary, Queen of Scots. According to our records this photograph is of Great Wyrley Secondary Modern in 1959, on a school trip to the Wedgewood Factory. Can anyone give us some names? We have in our archives a book entitled “A short history of Wesleyan Methodism at Wyrley”, printed in March 1925. 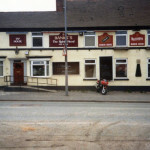 It gives the history of the chapel that was on the corner of Benton’s Lane and Gorsey Lane, before the one on the Walsall Road was built.